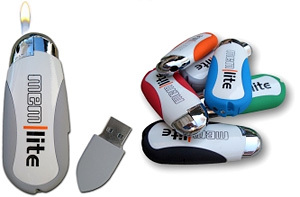 Memlite – Lighter & Flash Drive Together At Last | OhGizmo! By Andrew Liszewski on 10/02/07 • Leave a comment! The Memlite is basically just a refillable lighter with a removable flash drive stored in the bottom. While the obvious concerns of fire and electronics not mixing do come to mind if you’re a smoker you’re probably far more inclined to remember to carry a lighter with you than a tiny flash drive. So by combining the two you won’t have to worry about forgetting your flash drive at home, just remember to keep an eye on it when people ask you for a light.